Riverside Cemetery Association board member John Korfmann (above) and professional land surveyors (top, left) Dennis Rialland and Jeffrey Geiss recently completed a topside survey of the 5.5-acre cemetery at Towanda. The practical purposes for surveying the site are to correlate gravestones with cemetery burial records, map the cemetery to allow people to find their way around it, develop public park components, and assess the possibilities for new burial plots on the property. Fifty thousand dollars of in-kind survey field work services have been completed for the Riverside Cemetery and its governing body, the Riverside Cemetery Association (RCA). During the spring, summer and fall of 2015 and 2016, the team of Jeffrey Geiss and Dennis Rialland, certified land surveyors, retired certified land surveyor Betsy McKean, and Riverside Cemetery Association board member John Korfmann, identified and recorded single stones, multiple corners for family monuments, and other objects such as trees and plot fences. Every object is identified with a number, a photograph (nearly 3,000 total), and their absolute location is recorded using specific pairings of latitude and longitude in a Cartesian coordinate grid on the historic 5.5-acre property at 122 William Street. The topside survey is supplemented by hand recording of information of each grave marker by surveyor and RCA board member McKean. Also, a ground penetrating radar survey reveals approximately 300 unmarked graves. Most of the unmarked graves were found in the original southern portion of the cemetery, Potters Field and some perimeter areas. * Correlate gravestones with burial records. * Map the cemetery to allow people to find their way around it. * Develop public park components for the property. * Assess the possibilities for new burial sites on the property. projects,” Geiss said. 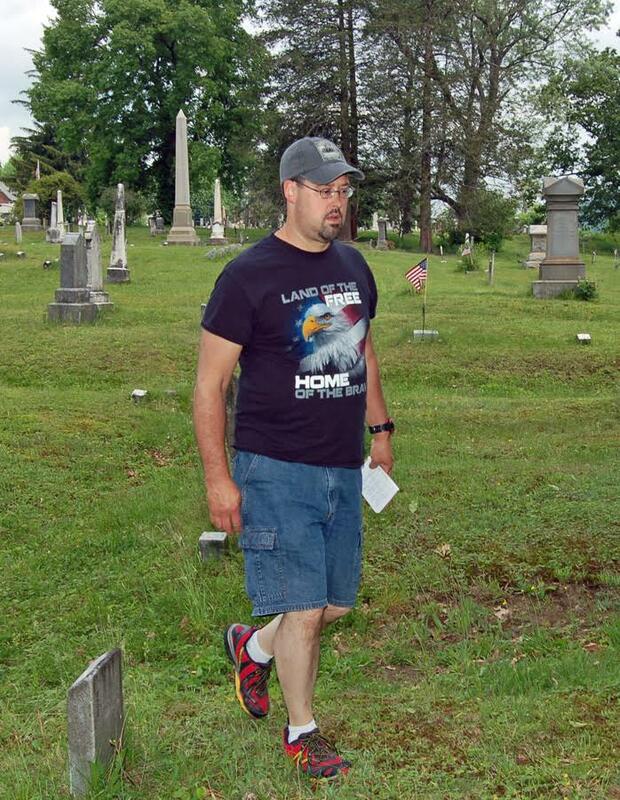 “It’s a relatively rare opportunity to contribute to a project as large as the Riverside Cemetery with such historical significance.” Geiss is a Bradford County native with broad, in-depth knowledge of the region. The earliest recorded burial in the cemetery is that of John W. Bingham, who fought and died in the War of 1812 and died on Oct. 28, 1830, at age 33 years, 3 months, 7 days. wing to its longtime designation as a burial site, the Riverside Cemetery is not regarded as an archaeological site. However, it is likely that earlier burials occurred there before the cemetery was officially located. The next step in the cemetery’s development is the production of a complete AutoCad map. With so many items, the report will be complex to produce. A timeline for its completion has yet to be determined. 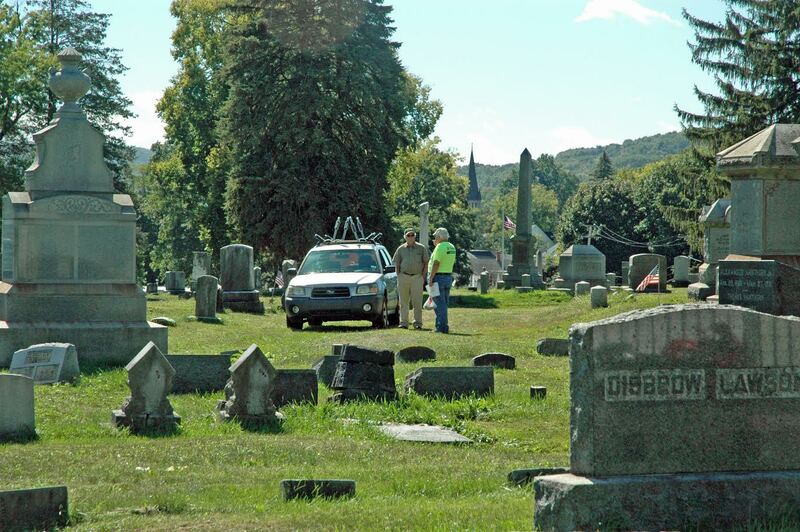 The ground-penetrating radar report is expected to be received by the Riverside Cemetery Association by the end of October. Repairs of the cemetery’s markers and maintenance of the property are ongoing. For more information about the Riverside Cemetery, please contact the Riverside Cemetery Association at rca122history@comcast.net or at 570-637-2281.